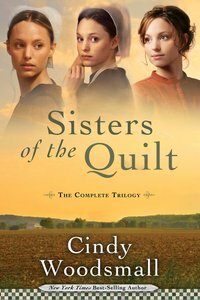 About "Sisters of the Quilt (Omnibus Edition) (Sisters Of The Quilt Series)"
CINDY WOODSMALL is the New York Times and CBA best-selling author of twenty works of fiction and a non-fiction book. She's been featured in national media outlets such as ABC's Nightline and the front page of Wall Street Journal. Cindy has won numerous awards and has been a finalist for the prestigious Christy, Rita, and Carol Awards. She lives outside Atlanta with her husband, just a short distance from her children and grandchildren. Hannah Lapp covered the basket of freshly gathered eggs with her hand, glanced behind her, and bolted down the dirt road. Early morning light filtered through the broad leaves of the great oaks as she ran toward her hopes…and her fears. A mixed fragrance of light fog, soil, garden vegetables, and jasmine drifted through the air. Hannah adored nature’s varying scents. When she topped the knoll and was far enough away that her father couldn’t spot her, she turned, taking in the view behind her. Her family’s gray stone farmhouse was perched amid rolling acreage. Seventeen years ago she’d been born in that house. She closed her eyes, breaking the visual connection to home. Her Amish heritage was hundreds of years old, but her heart yearned to be as modern as personal computers and the Internet. Freedom beckoned to her, but so did her relatives. Some days the desire to break from her family’s confinements sneaked up on her. There was a life out there—one that had elbowroom—and it called to her. She took another long look at her homestead before traipsing onward. Paul would be at the end of her one-mile jaunt. Joy quickened her pace. Her journey passed rapidly as she listened to birds singing their morning songs and counted fence posts. As she topped the hill, a baritone voice sang an unfamiliar tune. The melody was coming from the barn. She headed for the cattle gate at the back of the pastureland that was lined by the dirt road. Beyond the barn sat Paul’s grandmother’s house, and past that was the paved road used by the English in their cars. Paul used the cars of the English. Hannah’s lips curved into a smile. More accurately, he drove a rattletrap of an old truck. Even though his order of Mennonites was very conservative, much more so than many of the Mennonite groups, they didn’t hesitate to use electricity and vehicles. Still, his sect believed in cape dresses and prayer Kapps for the women. Surely there was nothing wrong with her caring for Paul since the Amish didn’t consider anyone from his order as being an Englischer or fancy. As Hannah opened the cattle gate, Paul appeared in the double-wide doorway to the barn. His head was hatless, a condition frowned upon by her bishop, revealing hair the color of ripe hay glistening under the sun. His blue eyes showed up in Hannah’s dreams regularly. He came toward her, carrying a pitchfork, a frown creasing his brow. “Hannah Lapp, what are you doing, stealing away at this time of day? The whole of Perry County will hear thunder roar when your father finds out.” He stopped, jammed the pitchfork into the ground, and stared at her. He nodded. “Ya.” A hint of a smile touched his lips. He often teased her about the word she used so much, threatening to tell everyone at the university about that word and the girl who used it. He knew her Pennsylvania Dutch pronunciation of the word as “jah” was correct, but that didn’t stop him from ribbing her about it. As the slight smile turned into a broad grin, it erased all seriousness from his face. Hannah clutched an egg, reared back, and mimicked throwing it at him. His laughter warmed Hannah’s insides. She placed the egg back in the basket, huffed mockingly, and turned to cross the lawn toward the house. This would be Paul’s fourth year to return to college. Once again he’d be leaving her throughout fall, winter, and spring—with letters being their sole communication. Even that limited connection had to come through his grandmother’s mailbox. Hannah’s father would end their friendship with no apologies if he ever learned of it. Hannah opened the door to the house, but Paul placed his arm across the doorframe in front of her, stopping her in her tracks. He bent close. Hannah kept her focus straight ahead. “Look at me, Hannah.” The soft rumble of his words against her ear made a tingle run through her. The aroma that she’d come to recognize as easily as the man himself filled her. His scent had come to make her think of integrity, and it made her long to draw closer to him. Several seconds passed before she managed to lift her gaze to meet his. His lips were pressed together in a smile, but his blue eyes held a look she didn’t understand. “Paul!” a shaky voice screeched out. The slow thump of a cane against the wooden floor announced that his grandmother was only a few steps from seeing them. Hannah took a step backward, thinking she’d die of embarrassment if anyone saw her this close to Paul. Hannah stared into his eyes, promising him anything. “I give you my word,” she breathed. From the berry patch, Paul heard the familiar chime of the sitting room’s clock. It rang out five times, but Paul needed no reminder of the hour. He was more than ready to see Hannah for a second time today and before he left for the fall semester. He dumped the handful of blueberries into the half-full galvanized bucket. He straightened the kinks out of his back and studied the horizon for a glimpse of Hannah. The moment they had washed the last breakfast dish, Hannah had scurried home, hoping no one had missed her. So they hadn’t managed to find a moment for private conversation. He turned his attention back to the almost-bare bushes, glad he’d bought two pints of blueberries from Lee McNabb’s Farmers’ Market yesterday. He’d had more than enough of treating Hannah as if she were only a friend when he was in love with her. If she were a few years older, he’d have shared how he felt long before now. But even if he told her and she felt the same way, she wasn’t the only one who would have to continue keeping their relationship hidden. If he wanted to keep her out of trouble with her father and even her community, he couldn’t afford to tell anyone about her. He had too many distant relatives in Owl’s Perch who could ruin their future by getting talk started. Assuming she was interested in a future with him. As Paul stood at the picnic table, adding the purchased berries to those he’d picked, he saw Hannah topping the hillock of the dirt road. The sight of her caused his pulse to race. Most of her beautiful chestnut-colored hair was hidden by the prayer Kapp. Her brown dress, thick with pleats, came far below her knees and was covered by a full-length black apron. The Amish aimed to be plain in every possible way, from their eighth-grade education to the strict codes of their clothing. A smile tugged at his lips. Hannah had the heart of a lioness and the gentleness of a kitten. Keeping her ordinary was a feat that couldn’t be accomplished by a set of rules—even the laws of the Ordnung. She spotted him and waved. He returned her greeting and set down the bucket. His entire being reacted to her: his heart pounded, his palms sweated, and his thoughts became jumbled. But what kept him returning to Owl’s Perch each summer wasn’t his physical attraction to her. There was something between them that he didn’t understand, but he knew it was hard to come by in a guy-girl relationship. With her as his wife and his degree in social work, there was no telling what the two of them could accomplish. He and Hannah both wanted to make a difference in the lives of others—especially children. What better way than to become a lifelong team, even though Hannah was just now learning how to pray and trust God. Until recently, for her everything had been a matter of adherence to rules. Paul watched her every move as she opened the back gate and crossed the field. As he unlatched the cattle opening to the front of the pasture, loving words rose in his throat and all but forced their way out of his mouth. But, as always, his lack of confidence and his respect for her more stoic ways kept the words unspoken. “Hi.” She handed him the cloth-covered bundle she’d been carrying. “You.” He spoke with absolute confidence. She clicked her tongue, warning him he was edging toward impropriety. He lowered the loaf and gazed into her eyes, not wanting to disrupt the power of the feelings that ran between them. To him, Hannah possessed all the courage, control, and nobility associated with lions. The term fit perfectly, even if its use did embarrass her. Finding her in the living room reading her Bible, he stepped to the round mahogany end table next to her. “Hannah’s here. We’re going for a walk.” He took one of the walkie-talkie radios off the table and turned it on. “If you need anything, just push this button.” He pointed to the knob with the musical note on it. “If you buzz us, we’ll come back pronto.” He set the radio on the table and attached the matching one to his belt loop. His grandmother’s eyes searched his face. Paul raised an eyebrow. “Please try not to need anything.” He kissed her on the head. Paul sighed. “Yes ma’am.” He hurried to the back door. Gram never allowed him to feel like an adult. When he was with his parents in Maryland, they gave him a lot more freedom than his gram did, and at the university he had freedom galore. He didn’t need it there. He checked his pocket for the gift box and bounded out the back door. Hannah stood on a knoll, staring across the green pastures at the grazing herd as the breeze fluttered through her skirts and played with the strings of the Kapp on her head. He’d love to have a photo of that. Any photo of Hannah would be nice. He came up to her and held out his hand. For the first time, she placed her hand in his. They jogged across the field and into the shade of the woods. When they came to a bridge that stretched across the creek, they slowed. Hannah peeled off her slip-on shoes and sat on the edge of the wooden planks. Her feet dangled high above the water. Paul shook off his sandals and sat beside her. For a moment no words were spoken. The sounds of the water babbling, some birds chirping, and an occasional cow mooing filled the air. Ignoring the nervousness that clawed at his gut, Paul covered her hand with his. “It gets harder to leave every year.” He drew her hand to his lips and kissed it. She gawked at him, as if she hadn’t ever expected him to kiss her. He leaned in closer, hoping to kiss her cheek. Clearing her throat, she pulled away from him. “I think it would be best if we go back now.” She stood. She picked up her shoes. “Don’t ask to see my heart and then return to your girls on campus.” Without looking at him, she stuffed a foot into each shoe. “I may not be educated like them, but I’m nobody’s fool, Paul Waddell. I’ve heard stories of what it’s like out there, and I don’t appreciate this. We’re better friends than this.” Brushing her hands against her apron, she lifted her gaze to him. She stared at him for a moment. “What are you saying?” Her hoarse whisper etched itself into his soul. She lifted the box from his hands and held it while questions remained in her eyes. She stared at him, her breathing rapid. Paul rubbed the back of his neck. Winning the approval of her family was an uphill battle, one he had to win or her heart would rend in two. He gazed into her eyes, hoping to assure her that he’d do his best. They both knew that if she married him, it would affect her relationship with her family for the rest of her life. Since she hadn’t been baptized into the Amish faith, she wouldn’t be shunned if she chose to marry a Mennonite. But her father wouldn’t allow an outside influence to enter his home any more than he would allow electricity. When she was permitted to have a rare visit, she would not be allowed to enter the house. Things weren’t that way in every Amish family, but that didn’t help Hannah’s situation. The key to winning over her father, Paul hoped, was patience and timing. As much as he wished for the right words to soothe Hannah’s concerns, he didn’t have all the answers. As if absorbing and accepting the truth of his feelings for her, a slow smile erased her distress. She managed a nod. “Is that a yes?” He clasped his hands over hers, which were still holding the unopened box. With her cheeks covered in a blush, Hannah removed the golden ribbon wrapped around the small box. She lifted the lid and pulled out a thin book, about two inches by three inches. Her brows knitted slightly as she opened the book to a page of columns and numbers. Paul nodded, unsure what she was getting at. “Ya.” Paul nodded and smiled. The two-way radio beeped at him, and Gram’s voice muttered his name. Carrying the bucket of blueberries, Hannah locked the back cattle gate and waved her last farewell to Paul. As she headed for home, her heart was soaring higher than the jets she’d seen streak across the sky. Wherever those people were going couldn’t be as exciting as where her dreams were taking her. What a remarkable man, to be willing to work for her father in order to win his approval, to wait patiently to win her family over. Her heart thumped with excitement, and laughter welled up within her. She moved the thin metal handle on the bucket of blueberries to her other hand and wiped a bead of sweat off her neck. Paul had spent time on a hot August afternoon picking berries for her family, and he’d get no credit for the kind deed. It was just like him to work hard for others and be thankful if he’d managed to be of help. She couldn’t believe such a wonderful man considered it a privilege to marry her. Since his dream was to become a social worker and for them to be foster parents, perhaps she could do him justice even though she had only an eighth-grade education. She loved children. And she knew how to run a household and how to turn a profit doing ordinary things like canning, sewing, and cleaning. The English girls at his college might have their education, but Hannah was determined to outshine all of them when it came to being a perfect wife for Paul and a wonderful mother to their children. She touched her Kapp, proud that Paul found her ways pleasing. Oh, there were so many things she wanted to ask him, so many conversations they could have now that she knew he loved her. She looked forward to his letters more than ever. This time, there was no question that the sea of girls out there held no interest for him. At the sound of car tires crunching against the pebbles on the dirt road behind her, she stepped to the far shoulder. Was it really possible that Paul had asked her to marry him? The tiny bubble of doubt burst as she slid her hand under her apron and felt the leather book in the hidden pocket. He’d put her name on all his hard-earned money. He trusted her with his heart, his dreams, and his earnings. He’d win her parents’ approval. She knew he would. Realizing the car she’d heard hadn’t passed her yet and assuming the driver wanted more space, she stepped farther to the side of the road. It was just a one-lane country road, used mainly by horses and buggies. She refrained from looking over her shoulder, even though the smell of the acrid fumes from the growling engine grew stronger. The car pulled up beside her. “Excuse me,” a man said. Hannah stopped and turned. She saw a sleek car that looked different from anything she’d ever seen. Shifting her gaze to the driver, she supposed he wasn’t even as old as Paul, although she couldn’t see much of his face. He had a beard that looked a couple of days old, and he wore a baseball cap and sunglasses. Feeling pinpricks of discomfort, Hannah smoothed her skirt with her free hand and swallowed hard. He wasn’t as unfamiliar with these roads as he’d made himself sound at first. Hoping he’d get in his car and leave, she started walking. She fought against the sense of panic, jerked her arm free of his grip, and ran. Two large hands hit her back, pushing her hard. She went sprawling across the gravel road. Her blueberries tumbled in every direction as the bucket flew from her hand. Hannah tried to stand up, but another forceful push to her back sent her careening again. She pulled herself to her knees, trying to gain her balance. As she scrambled to her feet, she realized her palms were bleeding. She glanced back at the stranger. Although most of his face was hidden behind his sunglasses, beard, and hat, she saw him smirk as he reached for her. Run, Hannah! Run! her mind screamed, but she couldn’t move. The man grabbed her by the thick apron straps that crisscrossed her back. He lifted her body slightly, dragged her to his car, spun her around to face him, and tossed her across the seat like a rag doll. Grabbing her by the pinafore, he shoved her farther into the car. The back of her head hit the door on the other side. Her vision blurred. The man climbed on top of her. Hannah pushed against his face and body, but he didn’t budge. She flailed at him, but he didn’t flinch. He repositioned his body, jerking at her skirts. Tears streamed down Hannah’s cheeks. Shadows swirled from within, as if she were being buried under layers of suffocating soil. Fear and anger joined forces within her, altering, shifting who she was, how she thought about life. When she no longer felt like Hannah Lapp, his weight lifted, and he pulled her out of the car. He dragged her several feet in front of the vehicle, then flung her to the road like a filthy rag. Only vaguely aware of her surroundings, she heard his car engine roar. Confusion lifted. She knew he intended to run over her. Crawling on her hands and knees, she moved out from in front of his car. Her dress tangled around her knees, and she couldn’t move any farther. She pulled herself upright. Gravel spewed from the tires. As he passed her, he flung the car door open, hitting her with it. She flew forward and landed hard on the ground as his car sped off. Gasping for air, she spotted the shiny silver pail lying near the ditch. On her hands and knees, she grabbed the bucket and tried to gather its spilled contents. Her body screamed out in pain with every movement, but Daed would be furious if she wasted the produce. She swiped at her tears, desperate to find all the berries. Clawing at the road, sifting through dirt and pebbles, she searched for the fruit, dropping each berry into the bucket. Dragging her apron across her eyes, she cleared the tears away. She looked in the pail. It contained mostly gravel and clods of earth with a few bruised and torn berries. After staggering to her feet, she turned in one direction and then the other. Confused, she stood in the middle of the familiar road. Which way was home? She had to get home. Her Mamm would know what to do. The scent of freshly baked bread wafted through the evening air, guiding her in the right direction. On the evening of their engagement, tragedy strikes and in one unwelcome encounter, all that Hannah has known and believed is destroyed. As she finds herself entangled in questions that the Old Ways of her people cannot answer, Hannah faces the possibility of losing her place in her family, in her community- and in the heart of the man she loves. When the Heart Cries is book one in the Sisters of the Quilt series. Order now to secure your copy when our stock arrives. Other edition is available. 9781601427137 0 Available. Expected to ship in 5 to 6 weeks from Australia.